Clara Morera graduated from San Alejandro School of Fine Arts in Havana. Morera primarily works in mixed media, creating assemblages that demonstrate her training in painting, tapestry, soft sculpture, drawing, and installation. She was a member of Grupo Antillano, a group of artists that articulated a vision of Cuban culture that privileged the importance of Africa and Afro-Caribbean influences in the formation of the Cuban nation, which was active in Cuba in the 70's and 80's. 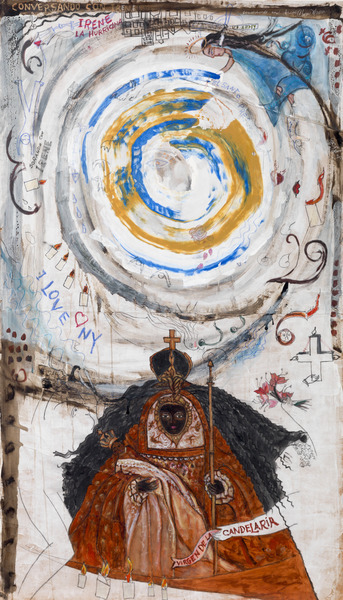 Her work reveals the rich syncretism of Santería, addressing themes of faith, magic, myths, and giving visual form to the intangible mystery of religion. 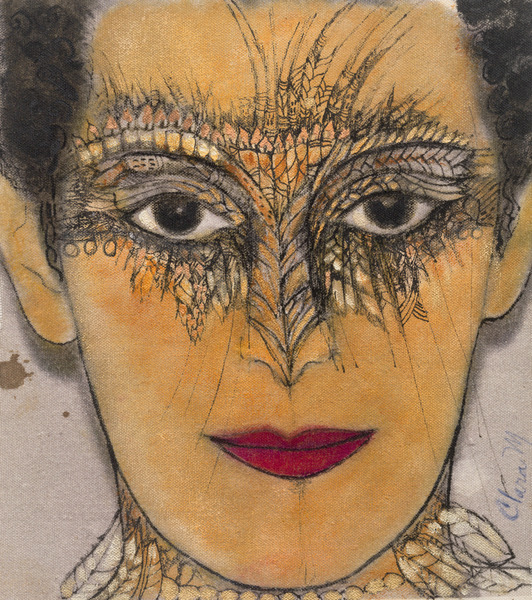 Her work has been exhibited in institutions such as the National Museum of Fine Arts in Havana; the Cuban Cultural House in Prague, Czech Republic; the Rye Art Center in Rye, New York; the Museum of the Americas in Miami, Florida; and The 8th Floor in New York. Conversando con Irene (Talking to Irene), 2014. Acrylic, colored pencil and pastel on paper, 53 x 30 in. Clara, 2014. Acrylic, colored pencil and ink on canvas, 8 3/8 x 7 3/8 in. El ángel de la anunciación (The Angel of the Annunciation), 2006. Mixed media on canvas and wood, 48 1/2 x 22 1/4 x 11 in. La gran flor (The Big Flower), 2014. Mixed media on kraft paper, 47 3/4 x 31 1/4 in. Machete de Shangó (Shango's Machete), 2013. Mixed media on wood, 27 1/2 x 4 in. Bandera de Oshún (Oshun's Flag), 2012. Mixed media on canvas, 58 x 33 1/2 in. Sarabanda. En el año de la serpiente (Sarabanda. In the Year Of the Snake), 2013. Mixed media on canvas, 56 1/2 x 36 in. Oshún Kolé, 2010. Mixed media on wood, 44 x 22 1/2 in. 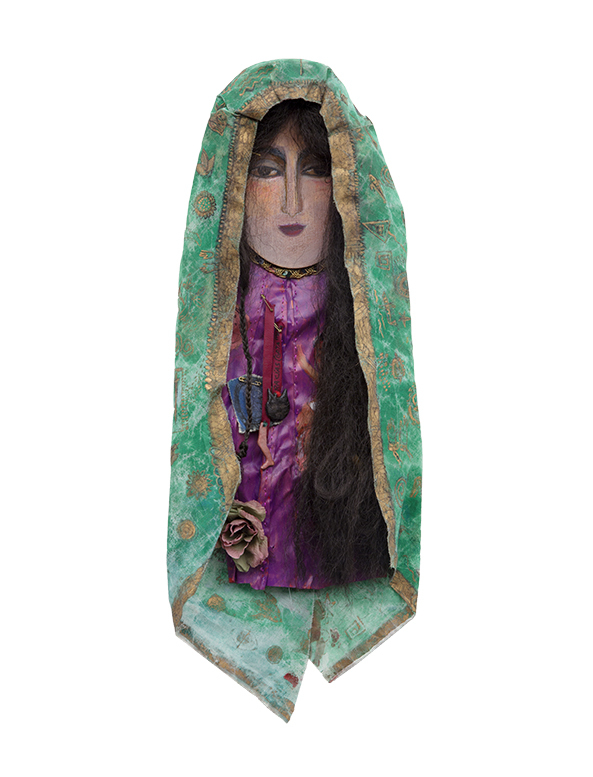 Virgen (Virgin), 2013. Acrylic and found objects on wood, 25 x 9 1/4 x 2 in. La Party Papaya, de la serie Ma-Corinas (The Party Papaya, from the series Ma-Corinas), 2013. Mixed media on paper, 34 3/4 x 54 3/8 in. A Santo Pajaro on Black (A Ma-Corina Vision), 2012. Acrylic, gouache, pencil and crayon on vinyl coated black kraft paper, 54 1/4 x 38 1/4 in. A Tale of Cuban Art History (Ma-Corina I), 2012. Acrylic, gouache, pencil and crayon on vinyl coated black kraft paper, 52 3/4 x 33 in. A Tale of Cuban Art History (Ma-Corina II), 2012. Acrylic, gouache, pencil and crayon on vinyl coated black kraft paper, 54 1/2 x 30 in. La Batalla de Oyá (Oya's Battle), n.d. Mixed media on canvas, 40 1/2 x 30 in. El Gran Sello II (The Great Seal II), 2009. Mixed media on wood, 48 x 36 in. El Gran Sello (The Great Seal), 2009. Mixed media on wood, 48 x 36 in. El chino de la charada (Los números de la suerte) (The Chinese of the Charade (The Lucky Numbers)), 2008. Mixed media on canvas laid on wood, 47 x 14 1/2 in. Árbol de la vida (Tree of Life), 2006. Mixed media on canvas, 55 1/2 x 37 1/2 in. Las 11 Mil Virgenes, Ursula o Las Islas Virgenes (The 11 Thousand Virgins, Ursula or The Virgin Islands), 2010. Mixed media on wood, 72 x 69 in. Autorretrato (Self-Portrait), 2010. Mixed media on wood, 30 x 24 in. La Kite Mayimbe, 2013. Mixed media on canvas and wood, 60 x 41 x 3 in. El Santo Pájaro (The Holy Bird), 2010. Mixed media on wood, 58 x 30 in. La manzana de la discordia (The Discord Apple), n.d. Mixed media on kraft paper, 59 3/4 x 44 1/4 in. Hija de Yemaya y Oshún (Daughter of Yemaya and Oshun), n.d. Mixed media on canvas, 27 x 14 3/4 in.